United Vets in Training (UVIT) is neither a private organization nor foundation. 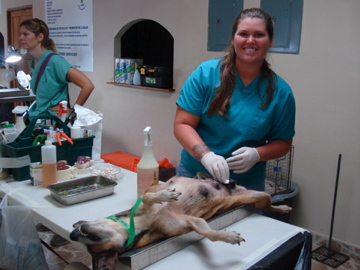 It’s simply a group founded by a pre-vet, UVA graduate (CLAS ‘09) and budding veterinarian, Jasmine Lister, that connects and networks pre-veterinary students from around the US to volunteer with Spay Panama. This means you will be responsible for arranging your flight to and from Panama City (PTY), Panama; health, well-being, and for the experiences that you will make and take from volunteering with Spay Panama. 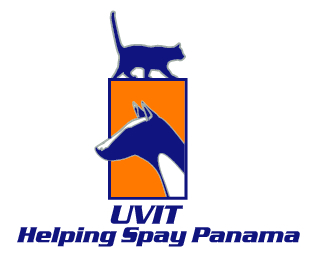 Spay Panama, is a non-profit spay/neuter program for dogs and cats in Panama City, Panama. The organization works with low-income gaurdians, rescuers and feeders, and utilizes various sterilization methods (i.e., the Quick Spay method and the Trap-Neuter-Release program). 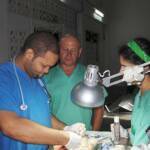 Spay Panama’s mission is to control the overpopulation of cats and dogs through an intensive sterilization program. It is neither a shelter nor a clinic; sterilization are only done to promote the adoption of homeless animals. Spay Panama's Animals Yes, USA, is a non-profit, 501(c)3 organization, all volunteer organization. We work in conjunction with Spay Panama for animal education, welfare, sterilization campaigns, and providing medical and surgical supplies. Your work may involve trapping and releasing sterilized animals. Shaving, giving injections of anesthesia, antibiotic, analgesic, dewormer, vitamins by following our dosage charts which are based on weight. Cleaning ears, tattooing dogs, cleaning cages, socializing the cats for adoption, cleaning to keep operation area ready for next session. Senior vet students will get hands on surgery experience under the direct supervision of a licensed veterinarian. 1) purchase $400 of veterinary surgical supplies. Orders from www.shopmedvet.com should be made through Dr. Dawn Straily at, dawn@shopmedvet.com, to get the discounted Spay Panama prices. Please click on the picture gallery below. 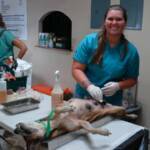 Jasmine Lister, a graduate of the University of Virginia and future veterinarian, created and founded UVIT Helping Spay Panama after her two week volunteer experience with Spay Panama during January 2009. She is pictured here on the left, at the Isla Taboga's Community Center, with a native islander, where Spay Panama successfully spayed and neutered over 70 dogs and cats.